Since the 19th century St. Vincent of Paul (1580-1660) has been presented as a Saint turned almost exclusively to caring for the poor. This is not true. He was also a great and shrewd politician who wielded much influence in the French royal court at the time of Louis XIII and Louis XIV. He fought Jansenism, Protestantism and, of course, Islam, the centuries-old enemy of the Catholic Church. In the excerpts below we bring to the attention of our readers two crusades the Saint wanted to launch but, for different reasons, were not achieved. What remains to admire, however, is his holy desire of destroying heretics and infidels, which should inspire Catholics. As Henry Ireton, the cruel son-in-law of Oliver Cromwell, carried on his work of annihilating Catholicism in Ireland, the English refugees and many French Catholics spoke to St. Vincent about a crusade against England. The Saint supported the project, and promised to speak with Cardinal Richelieu. To foster this project the Saint used two incentives – patriotic and religious. This crusade, however, was never realized because of the opposition of Richelieu. The Saints are audacious. 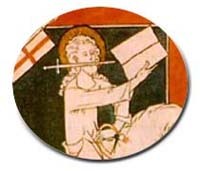 Seeing that he could not expect help from the government of France, St. Vincent had the idea of arming a fleet to punish the Turks of Argel, who were abusing the Christian name, enslaving and torturing numerous Catholics. He entered into negotiations with an intrepid seaman and knight named Paul, who enthusiastically took up the idea. He sought the necessary funding from the well-regarded Duchess d’Aiguillon and he managed to arm the ships. So that the expedition would not be considered a personal enterprise and to better overcome the obstacles, he finally convinced Louis XIV to give it an official character. In various letters, St. Vincent speaks of these negotiations that he was promoting. When everything was prepared, St. Vincent de Paul died, and the expedition was canceled.